The Reality Break features a mix of stand-up, sketch and musical comedy stretching from the early 20th century to just last Tuesday. 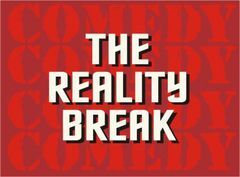 The Reality Break lets comedy speak for itself (but only for about a half-hour). The shows are a mix of recorded stand-up, sketch and musical comedy. Some programs focus on a particular group, comedian or album, others deliberately center on a singular topic like baseball or food, while the rest follow a strict free-form comedy stream of consciousness with no identifiable theme (or do they). The first three seasons of The Reality Break aired on WXCI. The first two in 1989 and 1990, and the third in 2000. The fourth comes to you on PRX. The first five programs in season four feature the audio comedy of Monty Python's Flying Circus. Future shows will focus on (a very edited) Bill Hicks, The Conception Corporation, and the Austin Lounge Lizards. The rest will be a virtual comedy "smoothie". A half hour comedy show featuring audio sketches of Monty Python. A half hour comedy show featuring songs and music of Monty Python. A half hour comedy show featuring cuts from "The soundtrack of the Trailer of the film of Monty Python and the Holy Grail"